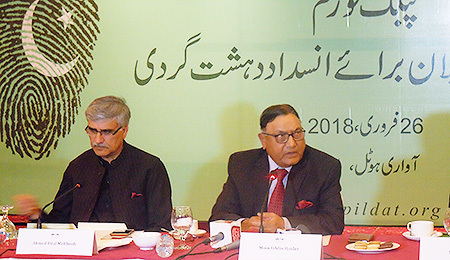 February 26; Discussing the implementation of National Action Plan in Punjab during the last quarter of 2017, speakers at the PILDAT Roundtable believed that the Faizabad sit-in has raised big question mark on the effectiveness of implementation of the National Action Plan in nearly 3 years. While this constituted as a flagrant violation across many NAP points, in particular it violated NAP point 3: Militant outfits and armed gangs will not be allowed to operate in the country as the protesters fought a pitched battle to push the might of State back in the operation. 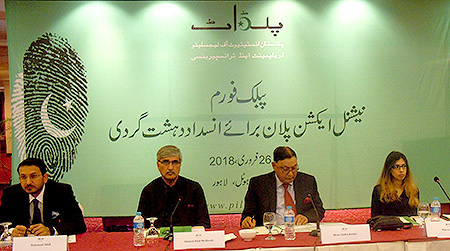 This was shared by PILDAT on its Sixth Public Forum on National Action Plan, where the Fifth Quarterly Monitor on the Implementation of National Action Plan on Counter Terrorism in Punjab was released. The Public Forum was addressed by Lt. Gen. (Retd.) Moinuddin Haider, Former Governor Sindh, Former Interior Minister; Ms. Marva Khan, Teaching Fellow, Sheikh Ahmad Hassan School of Law, Lahore University of Management Sciences; Syed Hammad Abid, SSP Intelligence, Counter Terrorism Department, Punjab, Mr. Ahmed Bilal Mehboob, President PILDAT and Ms. Aasiya Riaz, Joint Director PILDAT. Given the importance of the 20-point consensus-based National Action Plan (NAP) in countering terrorism in Pakistan, PILDAT has undertaken a citizens’ initiative to monitor the progress of implementation of the NAP. PILDAT Quarterly Monitors report progress based on publicly available data and aim to serve the purpose of advocacy for effective implementation. Ms. Aasiya Riaz, Joint Director PILDAT, provided an overview of the implementation status of NAP during the third quarter of 2017. She said that the Fifth Quarterly Monitor on Implementation of NAP in Punjab is a continuation of periodic monitoring of implementation of National Action Plan that PILDAT began in January 2017. She said that out the 15 NAP Points pertaining to the performance of Punjab, three NAP points have witnessed regression in their status of implementation while 10 have shown consistent progress. Overall the Punjab province has received Green traffic light (progress satisfactory) on 1 out of 15 NAP points; Green-Amber (progress somewhat satisfactory) on 6 NAP points compared to 9 in the previous quarter, followed by 5 Amber-Red traffic lights (progress somewhat unsatisfactory) compared to 2 such lights in previous quarter and 1 Red light which has consistently remained red throughout three years (unsatisfactory). Ms. Marva Khan opined that NAP’s implementation status should be looked at in the context of the larger political scenario in the country. She stated that political stability was imperative for the development of the country in every aspect. She stated that the role of the superior courts does not appear to be protection of fundamental rights of citizens but apparently a political tug of war. She also pointed out that while Anti-terrorism courts were working on a fast-track basis, many new legislation on aspects such as financial terrorism failed to address the root causes of the issue. Syed Hammad Abid, SSP CTD stated that Counter Terrorism Department Punjab has been working diligently since its creation. He pointed out that under Point No. 3 (Militant Outfits will not be allowed to operate in the country), convictions have increased 41% during the current quarter. Similarly under point no. 9 (taking effective action against religious persecution) there were no incidents of religious persecution, therefore this point should have been assigned a green amber light. He stated that Point no. 14 (measures against abuse of social media for terrorism) is a global issue and requires Big data analysis tools for effective monitoring. While this point comes largely under FIA’s jurisdiction, CTD’s Cyber crime wing has been doing a lot of work and around 826 websites have been banned by the PTA so far, on the request of CTD. Lt. Gen. (Retd.) Moinuddin Haider said that our country has been engaged in firefighting with respect to terrorism and militancy. Individual cases might be contained in this way, but the long-term goal is to create harmony in society, and to bring various groups together on the same page. He stated that it appears that NAP has been sidelined as a national issue, and it is not getting enough attention in the media. He remarked that for effective implementation of NAP and for good governance in general, the two institutions that need to be empowered and made effective are local government and police departments. He also pointed out that many of these militant and right-wing groups have used welfare organizations as a smoke-screen for their activities. Key Punjab MPAs who joined the Roundtable included Ms. Lubna Faisal, MPA, Ms. Kanwal Nauman, MPA, Ms. Nabeela Hakim Ali, MPA, Ms. Faiza Ahmed Mailk, MPA. The Roundtable was also joined by a number of opinion leaders and academia.